One evening while I was brushing Micah’s teeth he posed a question to me. Earlier that morning I had just returned from another event serving the NASCAR Camping World Truck Series community. While the strain of a traveling Dad can be a lot for a family at home to manage, our children are often reminded that the reason for my travels is to share Jesus with others. While he knows the purpose of my travels, this question came as a surprise because it was the first time he directly asked me about the successes of those travels. I shared with him about the chapel time we had at the racetrack, and that I had some really neat conversations with people about Jesus during the trip. We went back to brushing his teeth. After a few moments of silence, I continued. We stopped brushing and he looked at me with toothpaste in the corners of his mouth, wide-eyed. 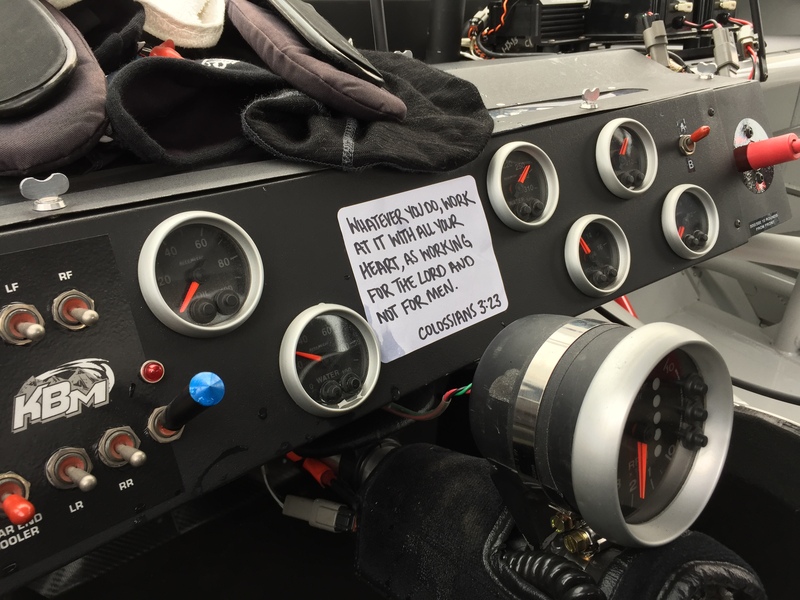 I shared with him that for this particular race I was able to offer the Invocation prior to the race, which is broadcast on FoxSports 1; and that through that Invocation all of those people heard the name Jesus! “I didn’t do anything!” He replied. “You absolutely did!” I affirmed. I went on to explain that if my travels were affecting him, or the rest of the family, in a negative way at home I could never make myself leave for these race events. That because of his obedience at home, millions have heard the name of Jesus through our families’ tenure in motor sports! I told him what an important role he plays, even if it doesn’t seem like it. It may not be a popular role, or always an exciting role…but it is a vitally important role in the Kingdom of God! Ananias’ story starts in Acts 9, as he is injected into the story of another man named Saul. At this point in his life, Saul is one bad dude; like extremist bad. He is on a mission against Christians. When we pick up in the story he is on his way to Damascus to have any Followers of the Way arrested. Along the way Saul has an encounter with the living God. An encounter that leaves him blind, hungry and thirsty in the middle of Damascus. As the story transitions from the lead character to the supporting role we find another man now standing center-stage…Ananias. This is Ananias’ first mention in scripture; he is just a simple disciple awaiting the persecution that is coming to Damascus; praying. As the story continues we see that God has a very special task assigned to Ananias. He is to go to Saul and lay hands on him. This was simply a crazy task. You see, as a Christian in Damascus, Ananias knew all about this man Saul and the persecution that was accompanying him. Going to Saul was a suicide mission. ‘God, you know who this guy is, right?‘ Ananias questioned. It wasn’t how a disciple would have imagined himself being used by God. It wasn’t teaching in front of a crowd of people. It wasn’t a role in the public spotlight. It wasn’t safe. It was down and dirty. It was dangerous. As a result, Saul became Paul; arguably one of the most important non-diety figures in Biblical history, theology and Christian tradition. Ananias’ obedience towards Saul was a paramount key in this transformation; and he wasn’t heard from again in the Biblical narrative. It is an amazing story about one man’s faithful obedience in the small things, and how it was used to completely transform history for the human race. But here is the part that really gets me; Ananias was the only one who could fulfill that purpose. God had already revealed to Saul that a man named Ananias was coming to him. Saul was expecting Ananias. Neither you nor I could have validated to Saul that God was real. Only someone named Ananias could do that. There was no ‘Plan B’. Only Ananias could be obedient in what he was being asked to do; no one could do it for him. If it weren’t for Ananias, there may be no Paul. It was a small, unwanted, seemingly unimportant yet dangerous task that changed history. One small act of obedience changes everything. Micah’s role at home, to keep me out on the road, may seem small, unwanted and unimportant…but it is changing history. Only he can be obedient in that; the obedience of no other child would do. The same is true for my entire family. So what is that thing you are being called to obedience in? We all have pictures of being used in grandiose ways; and no doubt some of you will be. Yet more commonly for each of us, small moments of seemingly insignificant obedience are having dramatic effects that will echo throughout eternity. Be obedient in all God puts in front of you, there may be no ‘Plan B’. Whatever you do, work at it with all your heart, as working for the Lord, not for human masters, since you know that you will receive an inheritancefrom the Lord as a reward. It is the Lord Christ you are serving. Our obedience in the mundane may be the very thing that God uses to transform history for the entire human race.